How fast is the Universe expanding? That’s a question that astronomers haven’t been able to answer accurately. They have a name for the expansion rate of the Universe: The Hubble Constant, or Hubble’s Law. But measurements keep coming up with different values, and astronomers have been debating back and forth on this issue for decades. The basic idea behind measuring the Hubble Constant is to look at distant light sources, usually a type of supernovae or variable stars referred to as ‘standard candles,’ and to measure the red-shift of their light. But no matter how astronomers do it, they can’t come up with an agreed upon value, only a range of values. A new study involving quasars and gravitational lensing might help settle the issue. This event not only confirmed a century-old prediction made by Einstein’s Theory of General Relativity, it also led to a revolution in astronomy. It also stoked the hopes of some scientists who believed that black holes could account for the Universe’s “missing mass”. Unfortunately, a new study by a team of UC Berkeley physicists has shown that black holes are not the long-sought-after source of Dark Matter. For the sake of studying the most distant objects in the Universe, astronomers often rely on a technique known as Gravitational Lensing. Based on the principles of Einstein’s Theory of General Relativity, this technique involves relying on a large distribution of matter (such as a galaxy cluster or star) to magnify the light coming from a distant object, thereby making it appear brighter and larger. However, in recent years, astronomers have found other uses for this technique as well. For instance, a team of scientists from the Harvard-Smithsonian Center for Astrophysics (CfA) recently determined that Gravitational Lensing could also be used to determine the mass of white dwarf stars. This discovery could lead to a new era in astronomy where the mass of fainter objects can be determined. The study which details their findings, titled “Predicting gravitational lensing by stellar remnants” appeared in the Monthly Noticed of the Royal Astronomical Society. The study was led by Alexander J. Harding of the CfA and included Rosanne Di Stefano, and Claire Baker (also from the CfA), as well as members from the University of Southampton, Georgia State University, the University of Nigeria, and Cornell University. To put it simply, determining the mass of an astronomical object is one the greatest challenges for astronomers. Until now, the most successful method relied on binary systems because the orbital parameters of these systems depend on the masses of the two objects. Unfortunately, objects that are at the end states of stellar evolution – like black holes, neutron stars or white dwarfs – are often too faint or isolated to be detectable. As they go on to state, of the 18,000 lensing events that have been detected to date, roughly 10 to 15% are believed to have been caused by compact objects. However, scientists are unable to tell which of the detected events were due to compact lenses. For the sake of their study then, the team sought to circumvent this problem by identifying local compact objects and predicting when they might produce a lensing event so they could be studied. In the end, the team determined that lensing events could be predicted from thousands of local objects. These include 250 neutron stars, 5 black holes, and roughly 35,000 white dwarfs. Neutron stars and black holes present a challenge since the known populations are too small and their proper motions and/or distances are not generally known. The future of astronomy does indeed seem bright. Between improvements in technology, methodology, and the deployment of next-generation space and ground-based telescopes, there is no shortage of opportunities to see and learn more. Welcome back to our series on Exoplanet-Hunting methods! Today, we look at the curious and unique method known as Gravitational Microlensing. The hunt for extra-solar planets sure has heated up in the past decade. Thanks to improvements made in technology and methodology, the number of exoplanets that have been observed (as of December 1st, 2017) has reached 3,710 planets in 2,780 star systems, with 621 system boasting multiple planets. Unfortunately, due to various limits astronomers are forced to contend with, the vast majority have been discovered using indirect methods. One of the more commonly-used methods for indirectly detecting exoplanets is known as Gravitational Microlensing. Essentially, this method relies on the gravitational force of distant objects to bend and focus light coming from a star. As a planet passes in front of the star relative to the observer (i.e. makes a transit), the light dips measurably, which can then be used to determine the presence of a planet. In this respect, Gravitational Microlensing is a scaled-down version of Gravitational Lensing, where an intervening object (like a galaxy cluster) is used to focus light coming from a galaxy or other object located beyond it. It also incorporates a key element of the highly-effective Transit Method, where stars are monitored for dips in brightness to indicate the presence of an exoplanet. In accordance with Einstein’s Theory of General Relativity, gravity causes the fabric of spacetime to bend. This effect can cause light affected by an object’s gravity to become distorted or bent. It can also act as a lens, causing light to become more focused and making distant objects (like stars) appear brighter to an observer. This effect occurs only when the two stars are almost exactly aligned relative to the observer (i.e. one positioned in front of the other). These “lensing events” are brief, but plentiful, as Earth and stars in our galaxy are always moving relative to each other. In the past decade, over one thousand such events have been observed, and typically lasted for a few days or weeks at a time. In fact, this effect was used by Sir Arthur Eddington in 1919 to provide the first empirical evidence for General Relativity. This took place during the solar eclipse of May 29th, 1919, where Eddington and a scientific expedition traveled to the island of Principe off the coast of West Africa to take pictures of the stars that were now visible in the region around the Sun. The pictures confirmed Einstein’s prediction by showing how light from these stars was shifted slightly in response to the Sun’s gravitational field. The technique was originally proposed by astronomers Shude Mao and Bohdan Paczynski in 1991 as a means of looking for binary companions to stars. Their proposal was refined by Andy Gould and Abraham Loeb in 1992 as a method of detecting exoplanets. This method is most effective when looking for planets towards the center of the galaxy, as the galactic bulge provides a large number of background stars. Microlensing is the only known method capable of discovering planets at truly great distances from the Earth and is capable of finding the smallest of exoplanets. Whereas the Radial Velocity Method is effective when looking for planets up to 100 light years from Earth and Transit Photometry can detect planets hundreds of light-years away, microlensing can find planets that are thousands of light-years away. While most other methods have a detection bias towards smaller planets, the microlensing method is the most sensitive means of detecting planets that are around 1-10 astronomical units (AU) away from Sun-like stars. Microlensing is also the only proven means of detecting low-mass planets in wider orbits, where both the transit method and radial velocity are ineffective. Taken together, these benefits make microlensing the most effective method for finding Earth-like planets around Sun-like stars. In addition, microlensing surveys can be effectively mounted using ground-based facilities. Like Transit Photometry, the Microlensing Method benefits from the fact that it can be used to survey tens of thousands of stars simultaneously. Because microlensing events are unique and not subject to repeat, any planets detected using this method will not be observable again. In addition, those planets that are detected tend to be very far way, which makes follow-up investigations virtually impossible. Luckily, microlensing detections generally do not require follow-up surveys since they have a very high signal-to-noise ratio. While confirmation is not necessary, some planetary microlensing events have been confirmed. The planetary signal for event OGLE-2005-BLG-169 was confirmed by HST and Keck observations (Bennett et al. 2015; Batista et al. 2015). In addition, microlensing surveys can only produce rough estimations of a planet’s distance, leaving significant margins for error. Microlensing is also unable to yield accurate estimates of a planet’s orbital properties, since the only orbital characteristic that can be directly determined with this method is the planet’s current semi-major axis. As such, planet’s with an eccentric orbit will only be detectable for a tiny portion of its orbit (when it is far away from its star). Finally, microlensing is dependent on rare and random events – the passage of one star precisely in front of another, as seen from Earth – which makes detections both rare and unpredictable. Surveys that rely on the Microlensing Method include the Optical Gravitational Lensing Experiment (OGLE) at the University of Warsaw. Led by Andrzej Udalski, the director of the University’s Astronomical Observatory, this international project uses the 1.3 meter “Warsaw” telescope at Las Campanas, Chile, to search for microlensing events in a field of 100 stars around the galactic bulge. There is also the Microlensing Observations in Astrophysics (MOA) group, a collaborative effort between researchers in New Zealand and Japan. Led by Professor Yasushi Muraki of Nagoya University, this group uses the Microlensing Method to conduct surveys for dark matter, extra-solar planets, and stellar atmospheres from the southern hemisphere. And then there’s the Probing Lensing Anomalies NETwork (PLANET), which consists of five 1-meter telescopes distributed around the southern hemisphere. In collaboration with RoboNet, this project is able to provide near-continuous observations for microlensing events caused by planets with masses as low as Earth’s. The most sensitive survey to date is the Korean Microlensing Telescope Network (KMTNet), a project initiated by the Korea Astronomy and Space Science Institute (KASI) in 2009. KMTNet relies on the instruments at three southern observatories to provide 24-hour continuous monitoring of the Galactic bulge, searching for microlensing events that will point the way towards earth-mass planets orbiting with their stars habitable zones. For more information, be sure to check out NASA’s page on Exoplanet Exploration, the Planetary Society’s page on Extrasolar Planets, and the NASA/Caltech Exoplanet Archive. Astronomy Cast also has relevant episodes on the subject. Here’s Episode 208: The Spitzer Space Telescope, Episode 337: Photometry, Episode 364: The CoRoT Mission, and Episode 367: Spitzer Does Exoplanets. In 2012, the Hubble Space Telescope Frontier Fields program (aka. Hubble Deep Fields Initiative 2012) officially kicked off. The purpose of this project was to study the faintest and most distant galaxies in the Universe using the gravitational lensing technique, thus advancing our knowledge of early galaxy formation. By 2017, the Frontier Field program wrapped up, and the hard work of analyzing all the data it collected began. One of the more interesting finds within the Frontier Fields data has been the discovery of low mass galaxies with high star formation rates. After examining the “parallel fields” for Abell 2744 and MACS J0416.1-2403 – two galaxy clusters studied by the program – a pair of astronomers noted the presence of what they refer to as “Little Blue Dots” (LBDs), a finding which has implications for galaxy formation and globular clusters. The study which details their findings recently appeared online under the title “Little Blue Dots in the Hubble Space Telescope Frontier Fields: Precursors to Globular Clusters?“. The study team consisted of Dr. Debra Meloy Elmegreen – a professor of astronomy at Vassar College – and Dr. Bruce G. Elmegreen, an astronomer with the IBM Research Division at the T.J. Watson Research Center in Yorktown Heights. To put it simply, the Frontier Fields program used the Hubble Space Telescope to observe six massive galaxy clusters at optical and near-infrared wavelengths – with its Advanced Camera for Surveys (ACS) and Wide Field Camera 3 (WFC3), respectively. These massive galaxies were used to magnify and stretch images of remote galaxies located behind them which were otherwise too faint for Hubble to see directly (aka. gravitational lensing). This six galaxy clusters used for the sake of the project included Abell 2744, MACS J0416.1-2403 and their parallel fields, the latter of which were the focal point in this study. These and the other clusters were used to find galaxies that existed just 600 to 900 million years after the Big Bang. These galaxies and their respective parallels had already been cataloged using computer algorithms that automatically found galaxies in the images and determined their properties. As the research duo go on to explain in their study, recent large-scale deep surveys have enabled studies of smaller galaxies at higher redshifts. These include “green peas” – luminous, compact and low mass galaxies with high specific star formation rates – and even lower-mass “blueberries”, small starburst galaxies that are a faint extension of the green peas that also show intense rates of star formation. Using the aforementioned catalogues, and examining the parallel fields for Abell 2744 and MACS J0416.1-2403, the team went looking for other examples of low-mass galaxies with high star formation rates. The purpose of this was to measure the properties of these dwarf galaxies, and to see if any of their positions accorded with where globular clusters are known to have formed. Debra and Bruce Elmegreen are no strangers to high redshift galaxies. Back in 2012, Bruce published a paper that suggested that the globular clusters that orbit the Milky Way (and most other galaxies) formed in dwarf galaxies during the early Universe. These dwarf galaxies would have since been acquired by larger galaxies like our own, and the clusters are essentially their remnants. Globular clusters are essentially massive star clusters that orbit around the Milky Way Halo. They are typically around 1 million Solar masses and are made up of stars that are very old – somewhere on the order of 10 to 13 billion years. Beyond the Milky Way, many appear in common orbits and in the Andromeda Galaxy, some even appear connected by a stream of stars. 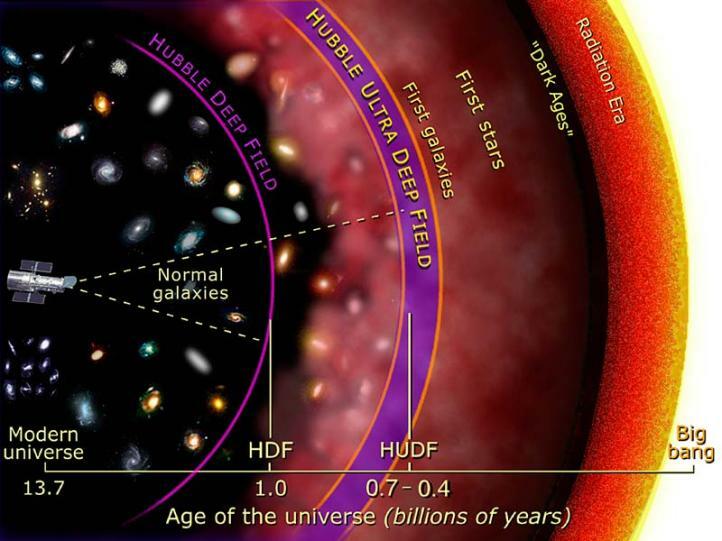 This study has many implications for our understanding of how the Universe evolved, which was the chief aim of the Hubble Frontier Fields program. By examining objects in the early Universe, and determining their properties, scientists are able to determine how the structures that we are familiar with today – i.e. stars, galaxies, clusters, etc. – truly came from. These same studies also allow scientists to make educated guesses about where the Universe is going and what will become of those same structures millions or even billions of years from now. In short, knowing where we’ve been lets us predict where we are headed! Since the deployment of the Hubble Space Telescope, astronomers have been able to look deeper into the cosmic web than ever before. The farther they’ve looked, the deeper back in time they are able to see, and thus learn what the Universe looked like billions of years ago. With the deployment of other cutting-edge telescopes and observatories, scientists have been able to learn a great deal more about the history and evolution of the cosmos. Most recently, an international team of astronomers using the Gemini North Telescope in Hawaii were able to spot a spiral galaxy located 11 billion light years away. Thanks to a new technique that combined gravitational lensing and spectrography, they were able to see an object that existed just 2.6 billion years after the Big Bang. This makes this spiral galaxy, known as A1689B11, the oldest and most distant spiral galaxy spotted to date. The study which details the team’s findings, titled “The most ancient spiral galaxy: a 2.6-Gyr-old disk with a tranquil velocity field“, recently appeared in The Astrophysical Journal. The team consisted of members from the Swinburne University of Technology, the Australian Research Council Center of Excellence in All Sky Astrophysics in 3D (ASTRO 3D), the University of Lyon, Princeton University, and the Racah Institute of Physics at The Hebrew University in Jerusalem. They then used the Near-infrared Integral Field Spectrograph (NIFS) on the Gemini North telescope to verify the structure and nature of this spiral galaxy. This instrument was built Peter McGregor of The Australian National University (ANU), which now is responsible for maintaining it. Thanks to this latest discovery, astronomers now have some additional clues as to how galaxies took on the forms that we are familiar with today. Based on the classification scheme developed by famed astronomer Edwin Hubble (the “Hubble Sequence“), galaxies are divides into 3 broad classes based on their shapes – ellipticals, lenticulars and spirals – with a fourth category reserved for “irregularly-shaped” galaxies. In accordance with this scheme, galaxies start out as elliptical structures before branching off to become spiraled, lenticular, or irregular. On top of that, this study showed that the A1689B11 spiral galaxy has some surprising features which could also help inform (and challenge) our understanding of this period in cosmic history. As Dr. Yuan explained, these features are in stark contrast to galaxies as they exist today. But equally interesting is the fact that it also differentiates this spiral galaxy from other galaxies that are similar in age. In the future, the team hopes to conduct further studies of this galaxy to further resolve its structure and nature, and to compare it to other spiral galaxies from this epoch. Of particular interest to them is when the onset of spiral arms takes place, which should serve as a sort of boundary marker between ancient elliptical galaxies and modern spiral, lenticular and irregular shapes. They will continue to rely on the NIFS to conduct these studies, but the team also hopes to rely on data collected by the James Webb Space Telescope (which will be launched in 2019). These and other surveys in the coming years are expected to reveal vital information about the earliest galaxies in the Universe, and reveal further clues as to how it changed over time. Gravitational lenses are an important tool for astronomers seeking to study the most distant objects in the Universe. This technique involves using a massive cluster of matter (usually a galaxy or cluster) between a distant light source and an observer to better see light coming from that source. In an effect that was predicted by Einstein’s Theory of General Relativity, this allows astronomers to see objects that might otherwise be obscured. Recently, a group of European astronomers developed a method for finding gravitational lenses in enormous piles of data. Using the same artificial intelligence algorithms that Google, Facebook and Tesla have used for their purposes, they were able to find 56 new gravitational lensing candidates from a massive astronomical survey. This method could eliminate the need for astronomers to conduct visual inspections of astronomical images. The study which describes their research, titled “Finding strong gravitational lenses in the Kilo Degree Survey with Convolutional Neural Networks“, recently appeared in the Monthly Notices of the Royal Astronomical Society. Led by Carlo Enrico Petrillo of the Kapteyn Astronomical Institute, the team also included members of the National Institute for Astrophysics (INAF), the Argelander-Institute for Astronomy (AIfA) and the University of Naples. While useful to astronomers, gravitational lenses are a pain to find. Ordinarily, this would consist of astronomers sorting through thousands of images snapped by telescopes and observatories. While academic institutions are able to rely on amateur astronomers and citizen astronomers like never before, there is imply no way to keep up with millions of images that are being regularly captured by instruments around the world. To address this, Dr. Petrillo and his colleagues turned to what are known as “Convulutional Neural Networks” (CNN), a type of machine-learning algorithm that mines data for specific patterns. While Google used these same neural networks to win a match of Go against the world champion, Facebook uses them to recognize things in images posted on its site, and Tesla has been using them to develop self-driving cars. The team then applied these neural networks to data derived from the Kilo-Degree Survey (KiDS). This project relies on the VLT Survey Telescope (VST) at the ESO’s Paranal Observatory in Chile to map 1500 square degrees of the southern night sky. This data set consisted of 21,789 color images collected by the VST’s OmegaCAM, a multiband instrument developed by a consortium of European scientist in conjunction with the ESO. These images all contained examples of Luminous Red Galaxies (LRGs), three of which wee known to be gravitational lenses. Initially, the neural network found 761 gravitational lens candidates within this sample. After inspecting these candidates visually, the team was able to narrow the list down to 56 lenses. These still need to be confirmed by space telescopes in the future, but the results were quite positive. In addition, the neural network rediscovered two of the known lenses in the data set, but missed the third one. However, this was due to the fact that this lens was particularly small and the neural network was not trained to detect lenses of this size. In the future, the researchers hope to correct for this by training their neural network to notice smaller lenses and rejects false positives. But of course, the ultimate goal here is to remove the need for visual inspection entirely. In so doing, astronomers would be freed up from having to do grunt work, and could dedicate more time towards the process of discovery. In much the same way, machine learning algorithms could be used to search through astronomical data for signals of gravitational waves and exoplanets. Much like how other industries are seeking to make sense out of terabytes of consumer or other types of “big data”, the field astrophysics and cosmology could come to rely on artificial intelligence to find the patterns in a Universe of raw data. And the payoff is likely to be nothing less than an accelerated process of discovery.